White oak handrail lengths from Richard Burbidge for use with 41mm stair spindles. Handrails in lengths of 2.4m, 3.6m, and 4.2m. 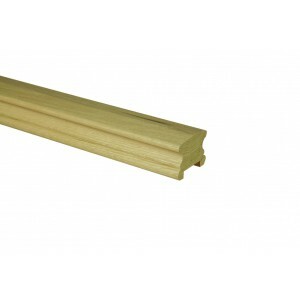 These handrail sections come complete with fillet strips, to fit between spindles. The sections are available in three set lengths but can be cut to size. Use these handrail sections with both post-to-post and over-the-post (continuous handrail) systems, to complete the look you want. This range of stair parts includes grand 41mm turned spindles with matching newel posts and volute newels, and you can choose between Classic White Oak fluted spindles or Trademark White Oak Imperial turned spindles.